Let’s face it, no matter how much we love our haircut, we all get bored with our hairstyles at times. How often have you looked in the mirror and wished you knew some quick, easy and clever tricks to get a different look? 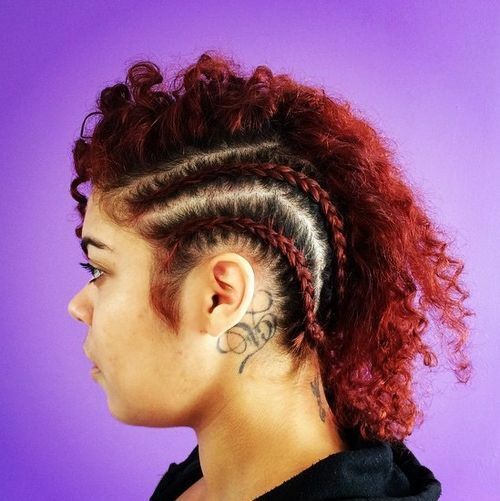 So today’s gallery is full of fancy ways to upgrade your short or mid-length hair. Read on to discover tips and ideas on how to vary your hair, for a more elegant, edgier, sexier or more relaxed image! 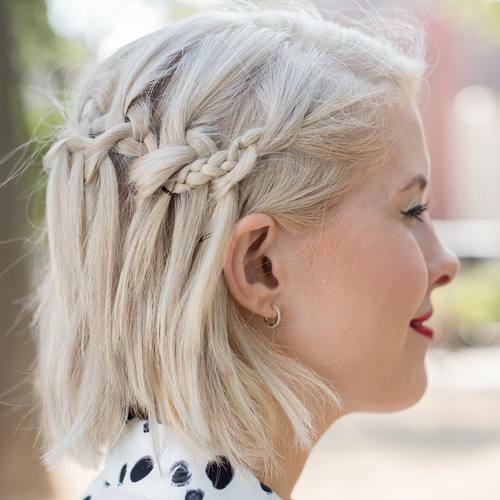 This is one of the cutest new hairstyles for short hair this season. And you can achieve it on a short back and sides cut which has length on top. 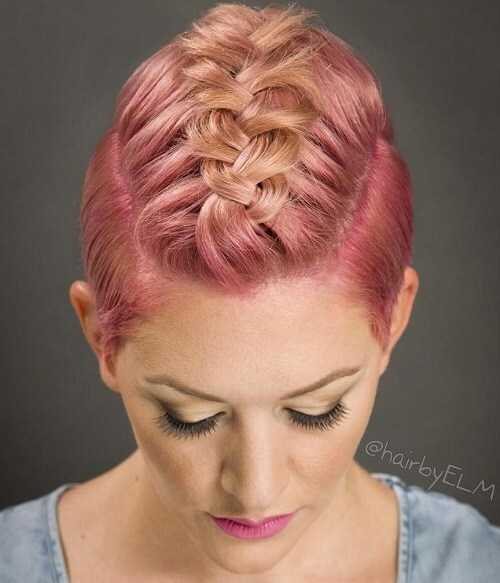 The main color is muted pastel-pink with a peach ombré, which when loosely plaited on top creates this adorable pattern! You can do it at home on blonde hair using temporary hair colors! Cutting edge hairstyles right now favor a choppy, uneven or shaggy finish. So don’t be afraid to add your own imperfect,’ messy braid details’! 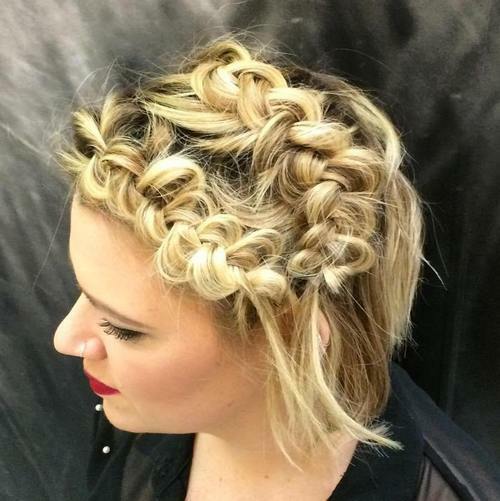 The idea of this trendy neutral blonde hairstyle is to create as many different textures as possible. The contrast draws attention to the model’s flawless complexion! The ‘rococo” style generally means art that’s overloaded with fussy detail. But I’ve used ‘rococo’ here as a compliment to this multi-textured hairstyle, which goes all-out to create as many different braid textures as possible. The result is a totally individual up-style with edgy spiky tips, balancing out the pretty, white ribbon bow perfectly! Here’s another very individual look, bringing together several different styles to create something totally new. 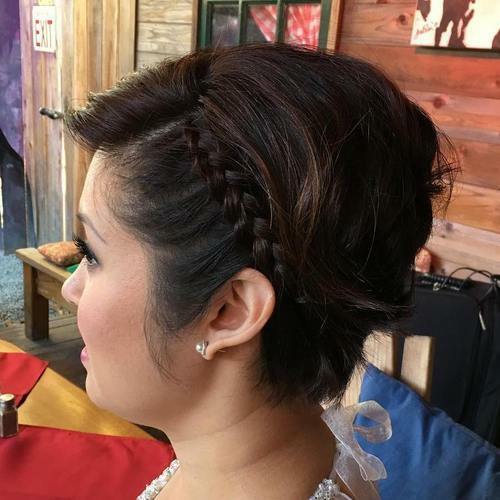 The side braid creates asymmetry and long hair at the crown is styled in messy volume, creating a faux-hawk that overhangs short hair cut into the nape. And pulling all the different styles together is the fantastic, peacock-blue color! There’s just something about this attractive hairstyle that makes me think ‘wedding hairstyle’. Basically, it’s a long bob in the latest light ash blonde, with a white blonde ombré. For a special occasion, lilac balayage was added to the ombré, along with a flat head braid adding a fabulous asymmetrical detail! This lovely long, straight bob has a super hair color design with beige- and ivory-blonde balayage highlights getting added definition from brown low-lights. And for a special occasion, add curvy flat braids, plus a short fishtail section and long, straight tips to create this pretty and romantic new look! With a side parting and side swept bangs, this model’s lovely, thick, brunette hair looks great in a bob cut. But she wants to look different when she goes out for dinner! 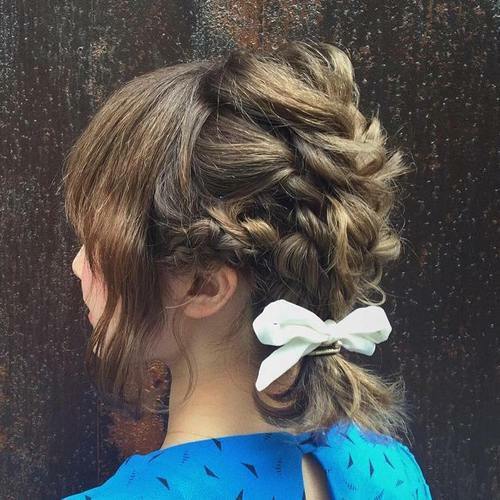 This cute braid idea creates new textures and emphasizes the trendy asymmetry of her haircut. So why not show off your pretty profile and your favorite earrings, too! This short, choppy angled-bob has a fab Boho look, thanks to fashionable yellow-blonde highlights that really brighten up mousey hair! However, if you have fine hair, it can be a struggle to get volume or texture. So when you want to jazz it up, try adding two fishtail braids for fabulous patterns, texture and height! This simple bob cut in rich dark coffee with an off-center parting is a very attractive, easy care hairstyle. But it’s nice to have a couple of trendy style ideas ready to vary your look. 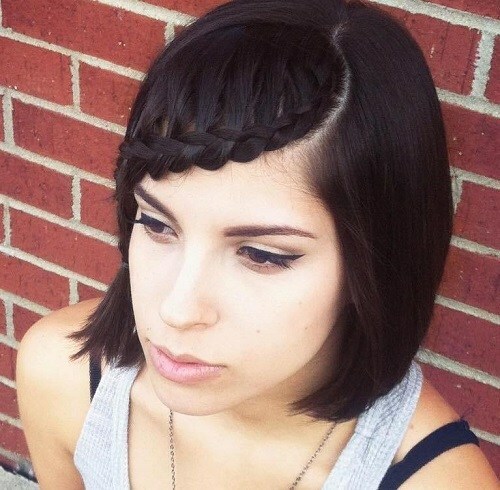 It’s easy to create this diagonal head braid moving across the forehead and down to frame the face on one side! Here’s a contemporary mid-length bob with dark blonde roots and a jazzy ash-purple and green color design. 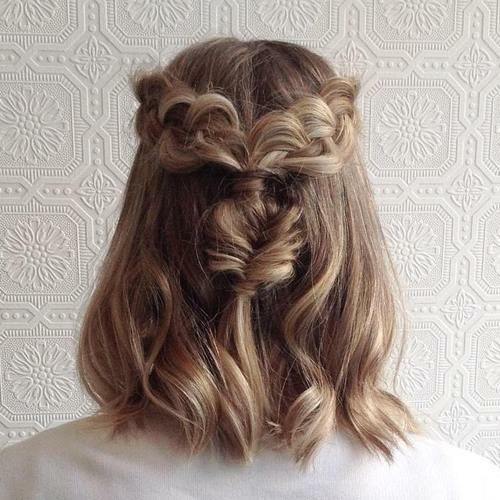 When you want to look different, copy this loose braid from forehead to crown and add a trendy topknot. With added height on top, smooth sides and shaggy, heavily textured tips this style is great for round faces! Hair bands are always in fashion and the latest trend is for braided bands. 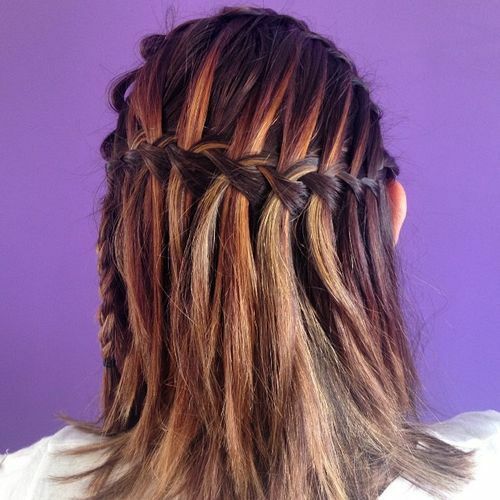 If your hair is long enough, make different types of braid and arrange them around the crown. 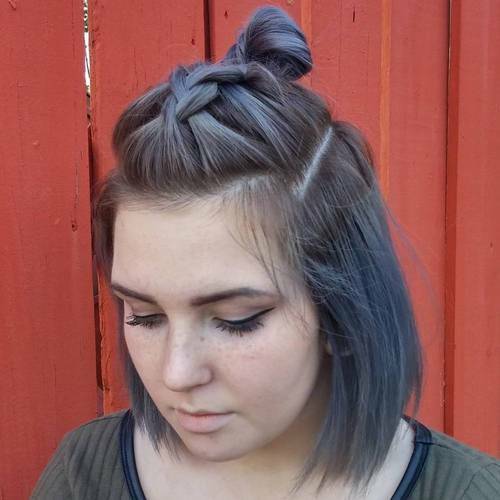 With so many hairstyles having different colored roots, you’ll get fabulous patterns in the braids and show off the edgy contrasting colors! Giving fine hair a 3-D hair color design is one of the best ways to create the illusion of thicker hair. This long bob has highlighting in three shades over brown roots, including light copper, hazelnut brown and bright ivory blonde. 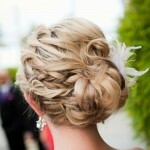 So a cute circle braid gives this tousled, messy style a cleverly contrasting touch of elegance! 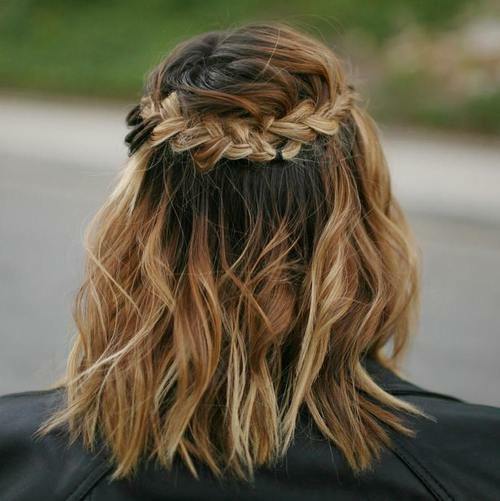 When you have a fabulous copper, brown and ash blonde hair color design, what better way to show it off than with this trendy waterfall braid. And this richly highlighted hairstyle has a very contemporary twist, in the cool ash-blonde section peeping out from underneath warm copper balayage at the back. 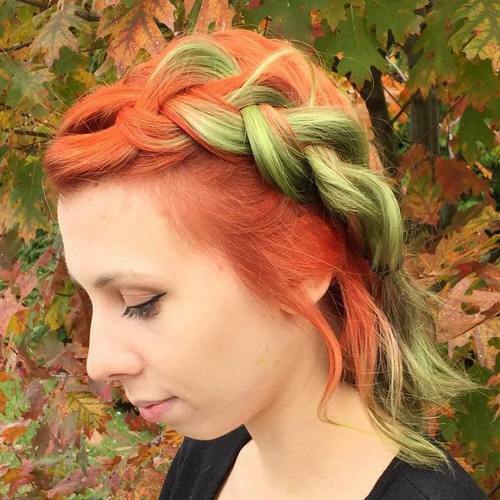 The vivid orange and green colors in this gorgeous, unconventional hairstyle are inspired by autumn leaves. 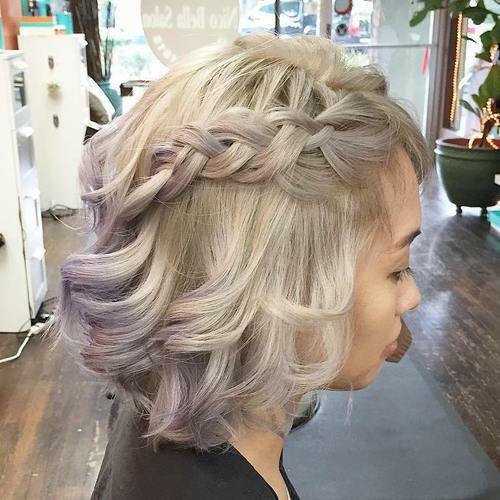 This style is here to encourage you to experiment with ‘wash-in wash-out’ temporary hair colors, like Crazy Color. 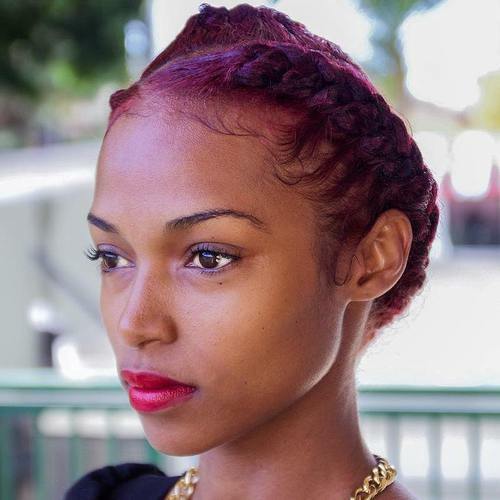 And don’t be afraid to invent your own asymmetrical braid hairstyles! 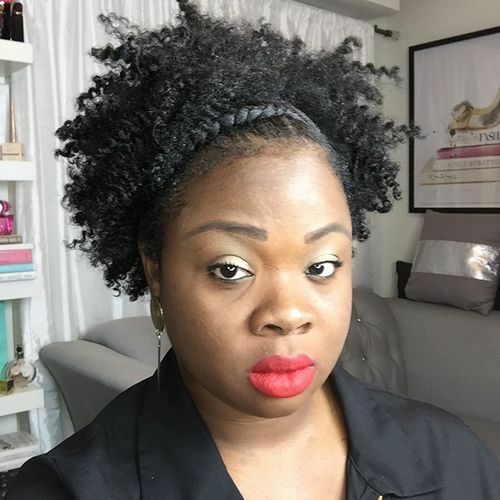 This hairstyle has fantastic natural volume and texture from the cute spiral curls. And there are many ways to vary it, like pinning one side back with a pretty, flower accessory. But popping-on a braided hair band, drawing attention to a lovely oval face, is the quickest way to add a touch of trendy elegance! When you’ve paid a lot of money to get this sophisticated blend of blonde, ash-brown, beige and dark roots, make sure everyone gets to appreciate the artistry! The messy, straight bob you normally wear will look extra-edgy and totally outrageous in this ‘bed-head’ version of the curvy head braid! If your hair is already platinum or white-blonde, you can easily color one side with temporary hair-dye, like this gorgeous peach shade. Then all you need is a very loosely woven braid starting above the forehead and along the top, to create this gorgeously glamorous twist on the faux-hawk! This elegant head-braid updo suits the model’s oval face-shape and creates several different textures. There are pretty, wispy tendrils softening the hairline, parallel lines in swept-back sides and lovely, woven braids. But to make it completely unforgettable, add a trendy plum-purple hair color and matching eye-liner! The windswept styling on this angled bob haircut is a fabulous contemporary look for thick hair. It creates an uneven bottom edge, accentuated by the heavily textured tips – but it lacked a special focal point. Enter the asymmetrical head-braid with curvy texture, which creates an attractive texture contrast and that special finishing touch! If you’ve tinted your hair with temporary dye and now you’re wondering what else you can do to change your look, why not try these fabulous curved braids? 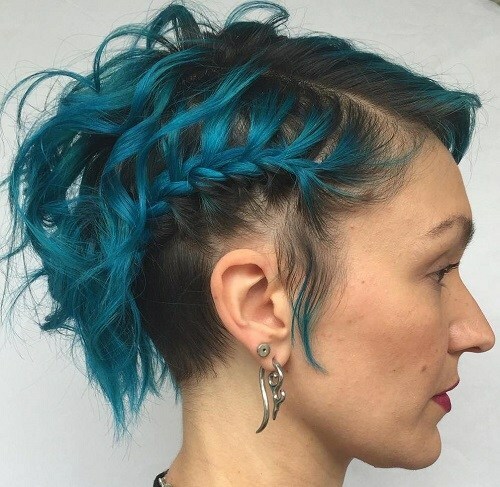 It’s a totally edgy, punky look on this model’s curly hair and with dark roots, white scalp and red braiding, you get extreme asymmetry and a stunning color pattern! This gallery is so packed with new ideas. I hope you’ll return many times to get fresh inspiration for your own short hairstyle upgrades and experiments!